A few years ago I had a pleasure to participate in a British project called National Inventory of Continental European Paintings: I have researched and made catalogue entries for 231 paintings in the collection of York Art Gallery, dating back from 15th century to ca. 1900. Obviously those earliest pictures interested me the most: among them there were some Central-European late-gothic panels and they were almost not researched earlier. 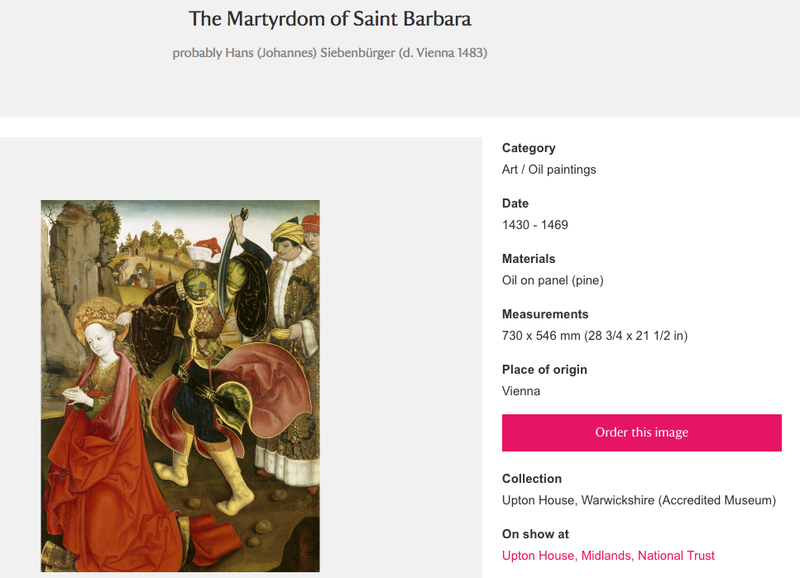 One of them was Flagellation of St. Barbara, described in museum’s files as late 15th-century piece from the workshop of Viennese Master of Schotten Altar. The same master I have written about in my previous post HERE. At first I have been shown a photo of the painting, uploaded to the museum’s database; that photo is, by the way, available in the Internet as well. Then I have seen an actual painting in the museum’s magazine, and what struck me the most was a high artistic quality of this panel, not recognizable from the photograph. It turned out that the picture has been renovated in 2007, and it made a lot of difference, but the photo was from before the renovation. 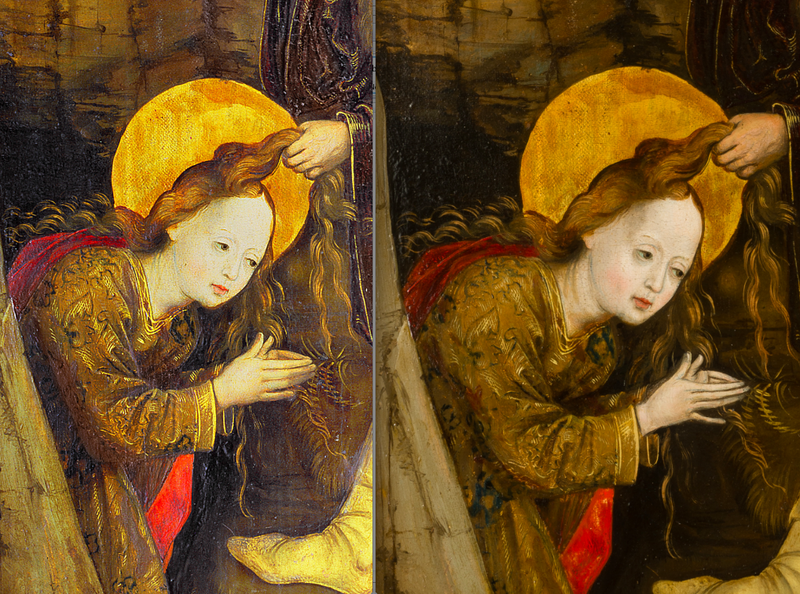 The conservation revealed not only high quality of the painting (visible e.g. in the modeling of character’s faces), but also such details as original composition of Barbara’s hands, with outstretched little finger (see below: to the left there is a old photo and to the right present version after the restoration). Another piece, undoubtedly coming from the same retable, is now in the collection of National Trust in Upton House, Warwickshire. 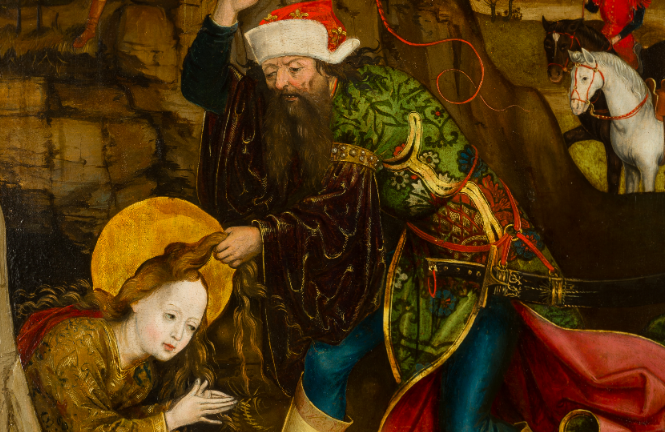 That one depicts Martyrdom of St. Barbara. Until recently it used to be described as dating back to the turn of the 14th and 15th centuries, because apparently the National Trust database uses artists’ names as described in the Union List of Artist Names®, and that one actually gives wrong dating of the Viennese Master of Schotten Altar (I have also written about that HERE). Prof. Robert Suckale has recently proposed that Master of Schotten Altar may be identified as Johannes (Hans) Siebenbürger: a painter from Transylvania, active in Vienna, who died in 1483. 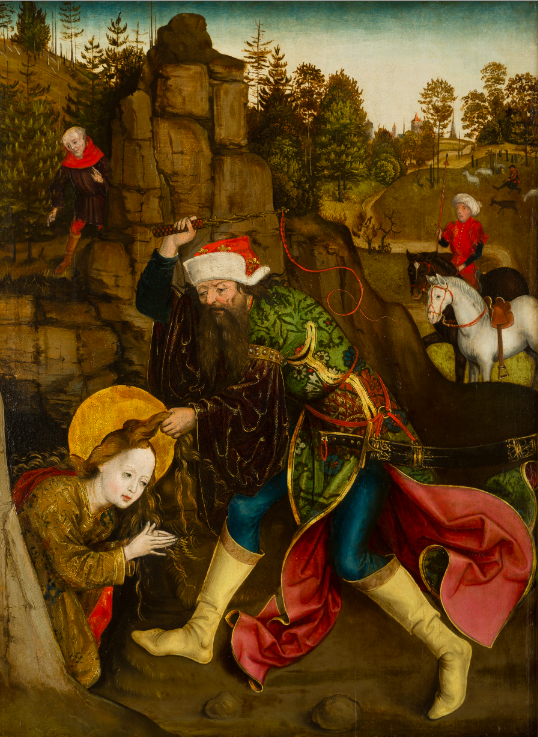 We know from the written sources that Siebenbürger painted Epitaph of Jodok Hauser (died 1478), today in the Österreichische Galerie Belvedere in Vienna. What else have I noticed when I looked at the Barbara panel in York Art Gallery? Well, I thought that the round face of St Barbara (with thick eyelids and double chin) as well as her father’s sunken cheeks and hooked nose seem to be close to the features of Virgin Mary and St Paul from Hauser’s epitaph in Vienna. It seems likely that Hans Siebenbürger worked in the workshop that created Viennese Schotten Altar, although not all the scholars agree that he may be identified as the main master. Robert Suckale attributed some further pieces to Hans Siebenbürger and some of these attributions have been widely accepted. 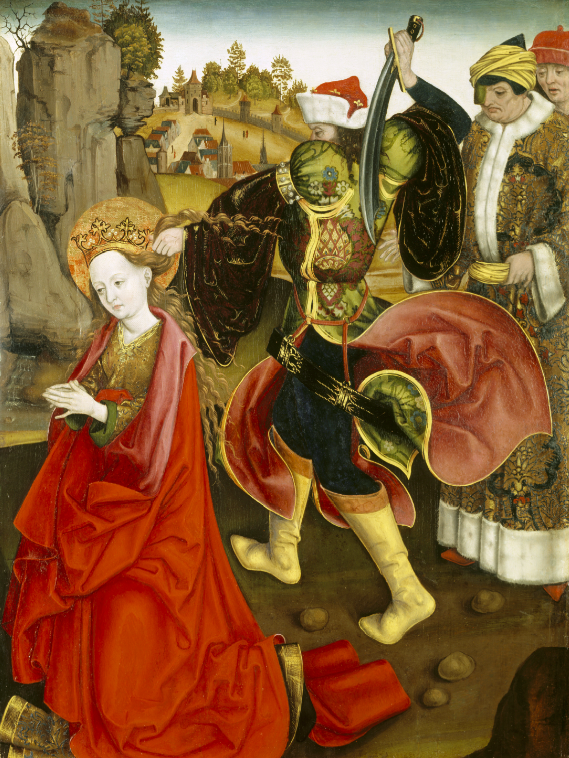 The curators from Belvedere in Vienna, for example, attributed to Siebenbürger a panel depicting Martyrdom of St Ursula, coming from Austrian Lilienfeld Abbey. I have managed to get to the information that at least two other panels from that retable have been known, however today their whereabouts remain unknown. One of them is Baptism of the Companions of St Ursula, last published in the Viennese auction catalogue in October 1931. The other is St Ursula Blessed by the Pope, which in the 1930s used to belong to Artur von Werther in Vienna, and was most likely taken to London Marianne von Werther (1901–1984), who moved there in 1939 and remained for the rest of her life. In the York Art Gallery files I have found a letter from Mrs Marianne von Werther to the gallery curator, dating back to 1970: in that letter she wrote about the painting she owned and attached (rather poor) photograph of it. I suspect that the painting is still in possession of Marienne von Werther’s descendants; unfortunately I did not manage to get in touch with them. Anyway, the panels with the legend of St Ursula seem to be close, in many aspects (e.g. 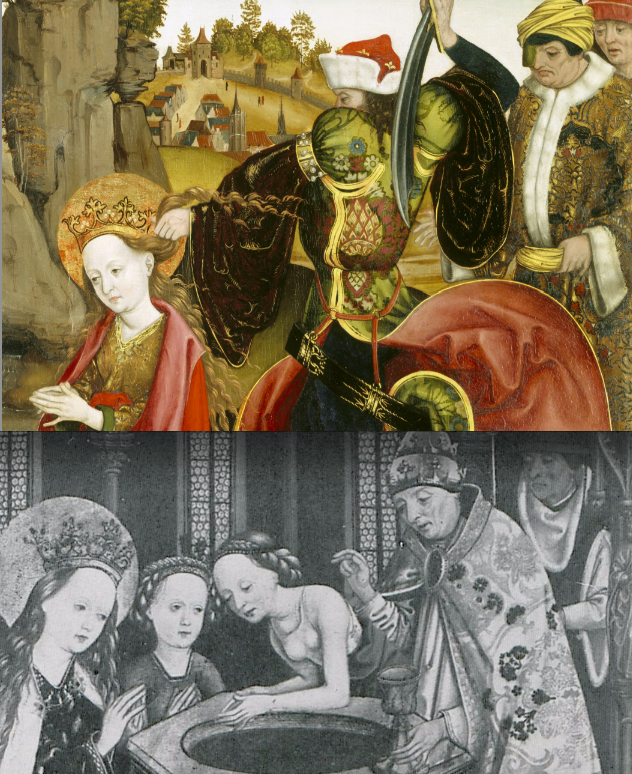 style, composition, features of characters), to the St Barbara panels, researched by me. To make a long story short: I believe that if we accept that Hans Siebenbürger was the author of Lilienfeld St Ursula retable, we should also ascribe him the panels now in York and Upton House. Robert Suckale has never mentioned the British panels in his publications – I assume he simply did not come across them. 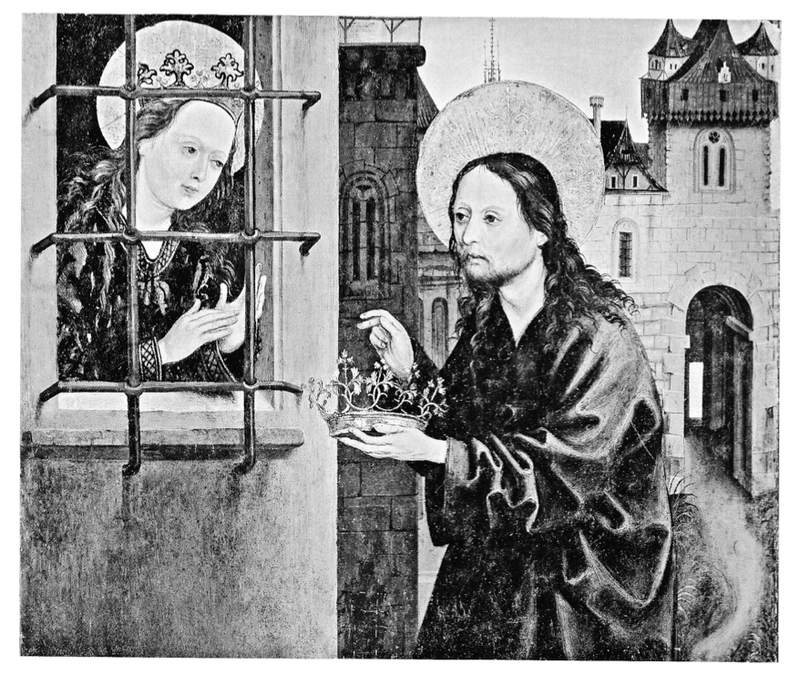 However, he came across something else: he published an old photo of a lost piece depicting Christ visiting imprisoned female saint, giving her a crown. That is a panel that obviously has been cropped; it has been on Munich art market in 1924 and it’s location remains unknown since then. In 2004 (in his article in “Die Länder der Böhmischen Krone und ihre Nachbarn zur Zeit der Jagiellonenkönige (1471–1526): Kunst – Kultur – Geschichte”) Robert Suckale attributed this panel to co-worker of Hans Siebenbürger, but later he changed his mind and in his (brilliant, by the way) book “Die Erneuerung der Malkunst vor Dürer” (Petersberg 2009) he attributed the piece to Hans Siebenbürger himself. When I saw a photo of that lost panel I immediately thought: wait a minute, that is another piece from “my” Barbara-altarpiece! 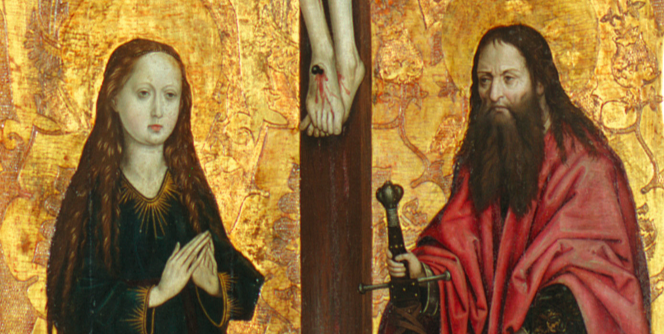 According to the legend, Christ visited St. Barbara when she was imprisoned; he comforted promised her salvation. The crown that Christ is giving to the saint refers to her future martyrdom; a very similar composition (with Christ offering a crown to the saint imprisoned in a tower) is in a 15th-century stained-glass in the cathedral in Stendhal, and it is in the window dedicated to the legend of St Barbara. Comparison of the dimensions of the panels in York and in Upton House with the cropped lost panel ensured me, that all of those depictions featured similar compositions and matching proportions of the figures! I must say, that the Nation Trust was the first to accept the results of my research – they have changed dating and attribution of their picture at their website, and they were kind to quote my name in the description. Of course, the catalogue note that I have written about the panel in York has also eventually been published on a website of the project I was working in. The full results of my research have recently been published in an article An attribution for two late Gothic central-European panels, in English public collections, depicting episodes from the life of St. Barbara, in: Quart 2(48)/2018, s. 3-20 (available on-line).